Many picture books portray the gains of adoption, but few celebrate it while admitting the reality of all that a child loses. 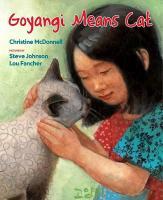 GOYANGI MEANS CAT by Christine McDonnell (Viking) gently and lovingly allows a child to grieve the experiences that came before. Parents who read this book aloud tacitly permit their child to express the grief that is an inevitable part of adoption. The author is an adoptive parent and a school librarian, and her understanding of and respect for children shines throughout this lovely book. Child-centered illustrations by Steve Johnson and Lou Fancher echo the theme of a safe space to explore loss.